Pages packed to the portals with petrifying, putrid, um undead. Part zombie history, part survival manual and part entertainment guide, this book promises a lot, but I'm not sure it quite delivers. With such a boastful title you would expect Matt Mogk to have put together an exceptional book. After all, Matt is considered to be the leading global authority on all things zombie, having been on various TV shows including the National Geographic Channel. The first section deals with zombies. What they are and their history. I found this the most interesting and I learned quite a bit of pop culture. 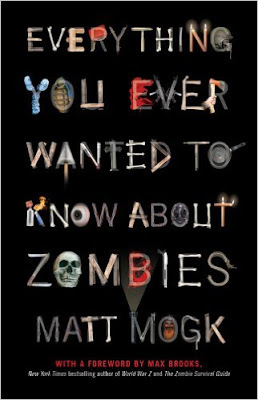 Matt sticks to the classic concept of zombies being the dead brought back to life. As a biologist I find that hard to accept (I personally favor the infected living type of zombie). The second part is basic survival information, tailored a bit to suit a zombie apocalypse. It would be hard to expect this book to be a true zombie survival guide, Max Brook has already done that. So while Matt gives a good overview he but does not add anything groundbreaking in terms of zombie survival. The last section is around pop culture and more contemporary zombie stuff. Zombies on the big and small screen, video games, zombie conventions and more! It is a pretty comprehensive examination and shows just how far reaching the humble zombie has staggered. There is some good bits of information in this book, like zombies doing the Levy Walk. Also, according to Matt's calculations, Australia is the top country to be in when the zombies rise up. Being a country girted by sea and having a low population density gives us the edge on everyone else. It is great that we are finally recognised as being the lucky country. A good book but somehow could have been better. Having founded the Zombie Research Society, Matt has created a society of over 60,000 zombie academics across six continents. You can also check out Matt's advice on the Zombie Research Society website.